With the theme “25 Years of Building Business Networks in the Construction Industry in the Southern Philippines,” CEBUCON remains relevant by showcasing product solutions, innovations and expertise that meet the current and future demands of the industry in the region. It was first conceived and organized in 1993 to be aligned with the vision that Cebu will become a major gateway of trade and tourism in the region. CEBUCON Organizer L.A. Ducut & Company, Inc.’s managing director, Lilibeth D. Abais, said that this milestone event is evident that CEBUCON delivers its commitment to be a vital trade link between suppliers and their market in the region’s construction industry as the popular venue for product displays, launchings, market tests and networking event among industry trade professionals, suppliers and stakeholders. One of CEBUCON’s pioneer and regular exhibitors, Manila-based industrial and power tools distributor Elektro Werk, Inc. (EWI) President James N. Tan stated that “with the exposures we have at CEBUCON it had contributed to our business growth. CEBUCON, as always, is beyond showcasing. Its organizer, L.A. Ducut & Company, Inc. extends value-added services to both its exhibitor and visitor markets even beyond the event.” Cebu Belmont, Inc.’s vice president for operations Engr. Felomino D. Ang, shared the same opinion: “[It] truly understands the local market, especially Cebu and Visayas.” This is one of the reasons why their company have been consistently collaborating their exhibit participation at the CEBUCON with their principals and suppliers. 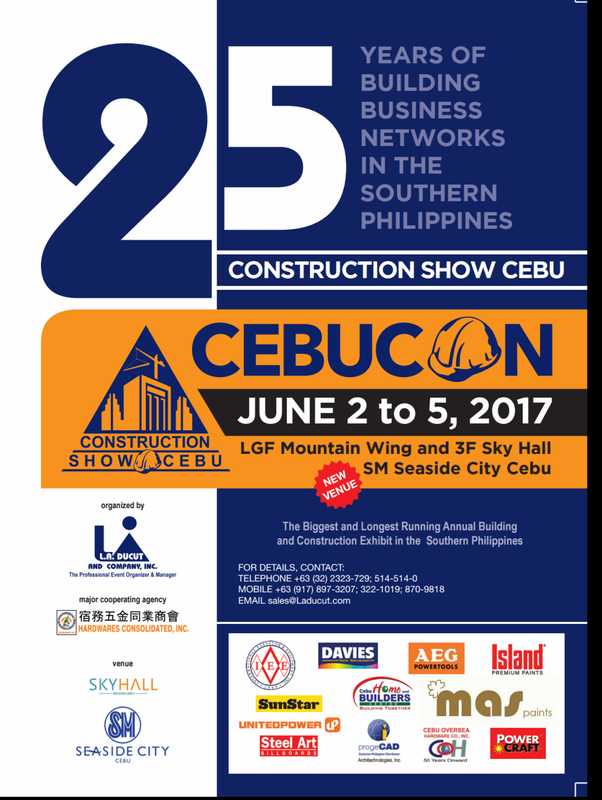 A first timer to CEBUCON is Architechnologies, Inc. to introduce its new software to the local market. “The ProgeCAD Professional 2018 is our next generation of alternative CAD product in the market, set to handle bigger sized files, this is the best version yet. We believe the event is an excellent venue to launch the latest offering of ProgeCAD,” stated technical director Ar. Dennis S. Mayo. “It is our belief that there are still a lot of professional who need the benefit of an affordable CAD package. We believe that CEBUCON also carries that belief of sincerely serving the AEC (Architecture, Engineering, Construction) industry and with this partnership, we are tapping the potentials and networks unreachable to us (at the Architechnologies),” he added. As Construction is a booming industry across the country. The robust building activities spread out in other parts of the nation given the massive national infrastructure spending by the government. For instance, in Central Visayas, majority of construction activities in the region are located in Cebu, including the P27.9 billion Cebu-Cordova Link Expressway (CCLEX), which had its groundbreaking last March; the P50-billion Metro Cebu Expressway that is set to start next year; the P9.2B New Cebu International Container Port; the P98 billion 25-kilometer Cebu rail project; and the P420 million worth Metro Cebu flood control projects, among others. Bohol and Siquijor also saw rapid infrastructure developments since the first semester of last year. Such strong growth of the construction industry here and elsewhere nationwide is seen to keep its momentum on the back of sustained economic fundamentals. The Philippine construction industry is expected to continuously grow in the next three years, bolstered by the residential and infrastructure markets. From $30.2 billion in 2015, Timetric’s Construction Intelligence Center (CIC) projects the sector to reach $47 billion in 2020 at a compound annual growth rate of 9.22 percent. As reported by BMI Research’s Philippine Infrastructure Report last January, construction industry is predicted to grow from P1.09 trillion this year to P1.73 trillion in 2021. The sector’s contribution to the country’s gross domestic product is, likewise, projected to expand from 6.8 percent in 2017 to 7.3 percent in four years. These prospects open new opportunities for L.A. Ducut & Company, Inc. to make CEBUCON more responsive to the needs of the local construction industry. The exhibit’s major cooperating agency is the Hardwares Consolidated, Inc.